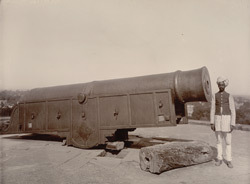 Photograph from the Curzon Collection, of a colossal cannon at Dig fort, Rajasthan, taken by the studio of Priyalall & Company in c.1900. Dig was established as the first capital of Bharatpur State by the Jat king Badan Singh (ruled 1722-33), and the fort was built by his son Suraj Mal (ruled 1733-63) in 1730. It was reinforced by twelve bastions, surrounded by a moat, and further defended by cannons, of which this is one. In this view a native has been made to stand next to it, to give an indication of scale.